Light a medium-low fire in a charcoal or gas grill. Set the red and green peppers and the eggplant on the grill and cook slowly, turning occasionally, until they are nicely charred on all sides and soft to the point of collapsing, about 30 minutes. As they finish cooking, transfer the vegetables to a large bowl, cover with a plate or plastic wrap, and let steam and cool. Using your fingers or a paring knife, peel the eggplant and the peppers. Remove any large seed pockets in the eggplant, and then stem and seed the peppers. Transfer the vegetables to a large bowl. 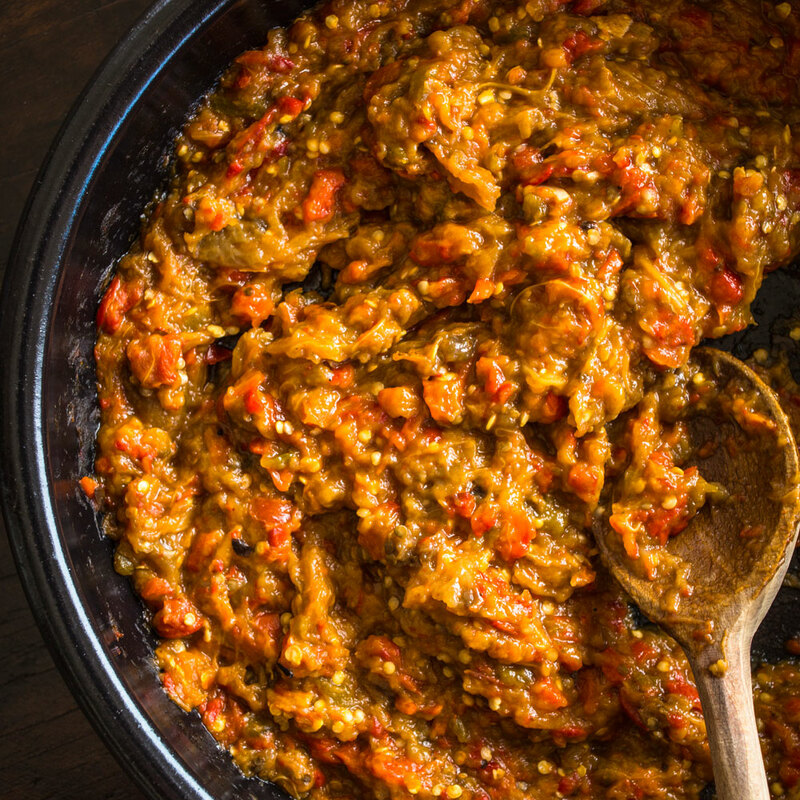 Using your hands, pull the peppers and eggplant apart into chunks, then crush and massage them between your fingers to form a coarse paste. Set aside. Using a mortar and pestle, the back of a heavy knife and a cutting board, or a mini food processor, crush together the garlic and salt, forming a paste. Add the garlic paste, olive oil, vinegar, black pepper, and the red pepper flakes and cayenne, if using, to the eggplant mixture and mix well. Taste and adjust the seasoning with more vinegar, salt, and black, red, and cayenne pepper if needed. Transfer to a jar and top with a 1⁄4-inch (6-mm) layer of olive oil. Cover tightly and refrigerate at least overnight before serving. Season lightly once more before serving. The spread can be refrigerated for up to 1 week (its flavor improves daily). The fresh red and green peppers can be charred on the stove top by setting them directly on a gas burner with the flame turned to medium-high and rotating them as they blacken. If the skin is fully charred but the flesh is not yet tender, transfer the peppers to a foil-lined sheet pan and bake in a 400°F (200°C) oven until soft to the point of collapsing, 10 to 25 minutes longer, depending on the thickness of the peppers. The eggplants can be cooked in a 400 °F (200°C) oven; pierce them a few times with a sharp knife, set them on a foil-lined sheet pan, and bake until soft to the point of collapsing, 30 to 40 minutes. From her many years of cooking with eggplants, Paula has found the best-tasting ones, especially for grilling or roasting whole, each weigh about 12 ounces (350 grams) and feel firm to the touch. Review Body: Never tried this before, added to my to-do list.